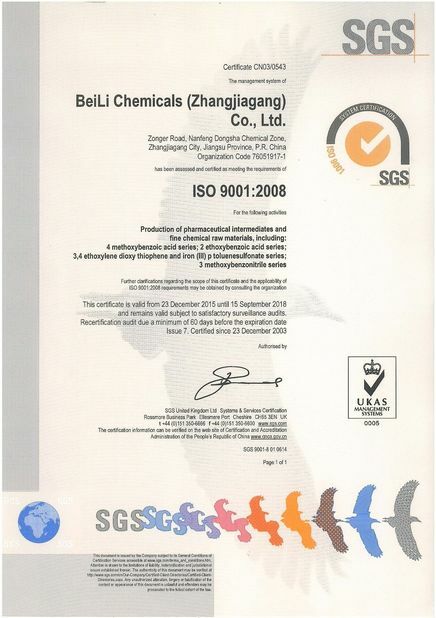 Quality Control - BeiLi Chemicals (Zhangjiagang) Co., Ltd.
BeiLi adopts a TQM (Total Quality Management) system based on SGS certified ISO 9001:2000, fully supports our daily QA (Quality Assurance) & QC (Quality Control) activities. Our analysis & inspection center are equipped with the latest testing equipments, which includes UV-Vis Spectrophotometer, High Performance Liquid Chromatographs (HPLC), Gas Chromatographs (GC), and Moisture Determination Meter etc. We conduct physical tests, chemical tests, purity tests for all of raw materials, intermediates, finished products used & produced in our manufacturing process. Scope/Range:Production of pharmaceutical intermediates and fine chemical raw materials,including:4-methoxybenzoic acid series,2-ethoxybenzoic acid series;3,4-ethoxylene dioxy thiophene and iron(III)p-toluenesulfonate series;3-methoxybenzonitrile series.